Apple sold more than five million iPod digital music players in the first three months of 2005, helping it to boost quarterly income six-fold. Buoyant sales of iPods helped the firm raise its net income by 530% to $290m (£153m; 224m euros), compared with $46m for the same period last year. Revenues rose 70% to $3.24bn after good growth in all product categories. The results came after the end of US trading but its shares fell on fears that earnings might dip later in 2005. 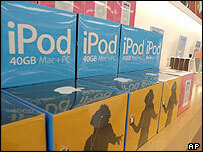 Apple sold 5.3 million iPods over the period, an increase of more than 550% on the corresponding period last year. Sales of PCs rose 43% to more than one million, thanks largely to the success of the new Mac mini - a cheaper version of the Macintosh PC - and new PowerBook notebook computers. More than 40% of Apple's sales during the period were outside the US, reflecting the popularity of the iPod across Europe and Asia. Steve Jobs, Apple chief executive, said he was "delighted" with the profit and revenue figures, which were both a record for the quarter. "Apple is firing on all cylinders and we have some incredible new products in the pipeline for the coming year," he said. However, Apple said it expected earnings per share to be lower in the third quarter - at 28 cents a share as against 34 cents a share over the latest period - and revenues to remain largely flat at $3.25bn. After the closing bell, Apple shares fell 0.6% to $40.76. Analysts gave mixed views on Apple's performance. "Its second quarter is traditionally its toughest quarter and these numbers are good," said Jim Fisher, vice president and senior portfolio manager of Univest Wealth Management & Trust, told Reuters. However, Sushil Wagle - senior vice president of J&W Seligman - said revenue forecasts for the third quarter were below some expectations, explaining the fall in the share price.